Get a taste of perfection with the delicious dishes from Pyramids Cafe Mediterranean Cuisine in New Orleans, Louisiana. Whether you are dining with us for a romantic evening out, ordering takeout for your family, or even need catering for your next gathering, you can find a vast selection of enticing dishes that you are sure to love. Our professionals cook every item on our menu from scratch and never from cans. Everything is marinated to perfection in our flavorful Arabic and Mediterranean spices. We even purchase certain food items from local retailers to ensure ultimate freshness. Our chefs take pride in making the most delicious Mediterranean-inspired meals in the area. Our most popular dishes are the gyro and chicken plates. To make the gyro, we marinate and cook lamb and beef together as a solid piece of meat. We then cut this in strips and serve it with a salad, hummus, or any other side you prefer. 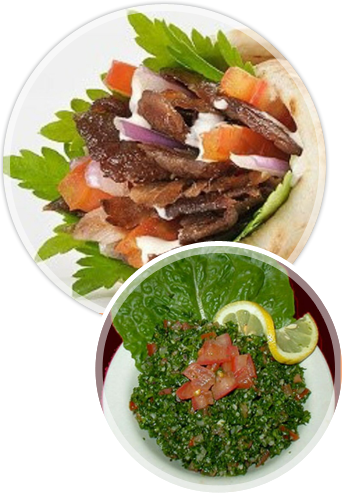 At Pyramids Cafe Mediterranean Cuisine, our dinner plates are almost double the quantity that our competitors give for a lower price. We take pride in offering lunch and dinner starting as low as $10 and up to $30.